Walking with Nordic poles burns 20-40% more calories than normal walking. Here's Laura and Kelly's review of a training session in Trent Park Forest. Laura: When I was asked to go Nordic Walking I thought to myself sure how hard can it be? Walking with poles won’t be much different to normal walking will it? Well, I’ll tell you now I could not have been more wrong. The reason I was first interested in trying Nordic walking is that I walk regularly, about an hour a day, with my puppy Diesel. I wanted to see what extra benefits Nordic Style Walking would bring to an exercise I already enjoy. Kelly: I am really into fitness and like trying new things to keep me motivated. When the opportunity to try Nordic Walking came up I was really looking forward to it. I had heard lots about the differences between ordinary walking and Nordic walking and how much more you can get from the latter. I strapped on my heart rate monitor so I could check how many calories I would burn in comparison to a normal walk and whether I could elevate my heart rate into a higher training zones. Laura: So we set of on our drive to our training location which was Trent Park Forest in North London. When we arrived at Trent Park the scenery was beautiful, it was a crisp winter’s morning and for 9.00am there was plenty of activity going on. There were runners, power walkers, hikers and dog walkers. Straight away I felt this was an ideal spot for my first Nordic walking experience, mainly because there were other people doing similar activities so we wouldn’t stick out so much. Kelly: What a great location, crisp sunny day and plenty of space to walk, walk, walk. Laura: Our training session of 2 ½ hours started at 11.00am. We met up with our trainer Liz Gibson about 10 mins before. Liz was lovely, really friendly and enthusiastic. Liz is a trained INWA (International Nordic Walking Association) qualified Nordic Walking Instructor and is affiliated to the Nordic Walking UK association. For further information about lessons with Liz or other trainers and sessions near you, please see the details at the end of this article. The first thing we had to do was ensure we got the correct sized poles. The correct length of pole is determined by a number of factors including height, length of stride, fitness level and terrain to be walked but as a general rule, the length of pole will be about 68% of your height and when holding the poles correctly, your lower arm (from wrist to elbow) should be parallel with the ground. I am 5’7” so I had the 115cm long Exel trainer poles. Once Liz was happy that we had the correct poles we got started. Kelly: I’m also 5’ 7” and used 115 cm Exel trainer poles – these are ideal for both beginner and experienced Nordic Walkers. Laura: The first stage of our session was the warm up; we found a clearing in the forest and got started. Warm up included basic moves such as, rolling your neck, circling your shoulders and ankles. We then went onto using the poles as an aid to the warm up (and yes we were getting a few strange looks at this point). We used the poles in many ways, such as how you would use a paddle in a kayak. I found the warm up very thorough and felt ready to go after we had completed it. Kelly: Nordic Walking is not like ordinary walking and it’s worth spending the time to warm up properly to avoid injury and soreness. During the warm up Liz gave us lots of information on the background of Nordic Walking, the equipment we were using and the benefits. Laura: Liz then went on to adjust the pole straps to fit our hands, it’s really important that the straps fit correctly so that you can use the poles correctly. The straps on the tops of the poles have to be adjusted so they fit your hand comfortably and do not rub anywhere. I recommend wearing thin gloves as your hands do get very cold and the straps can sometimes rub. When you have mastered the technique of Nordic walking the strap of the pole is what you lean on when you push the poles back so it is very important that it fits correctly. Laura: Once our straps had been adjusted we started to get used to the feel of the poles while we were walking. We did this by dragging the poles behind us to get an idea of their weight, they are surprisingly light. However it is not as easy to walk with them as it may sound as the ground was very muddy and uneven so it can take a bit of getting used to. The next stage is to then start mastering your basic walking technique by getting the poles to ‘plant’ in the correct way. When I say ‘planting’ the poles this means getting the poles to land in the correct position when you are walking with them. The poles should ideally be ‘planted’ mid-stride, between your front and back foot at an angle of about 45 degrees. Arms also need to move correctly. This is something that I found particularly hard, I wanted to bend my arms at my elbows, but this is wrong. The movement has to come from your shoulders like you are going to shake someone’s hand, this did take a bit of grasping and Liz did have to correct me several times. Liz was very patient and recognised that it is important to get the technique right from the start to get the most out of the exercise. Once we had grasped the basic technique we started the proper walk. The ground was very muddy in places, luckily the poles actually made it easier to walk even on very uneven and muddy ground as they support you and make sure you don’t lose your balance and slip. What’s surprising is that as you start to use the poles, you automatically speed up and your stride gets longer. This is not something you are consciously doing it just sort of happens. The next level to the technique is to start pushing off from the poles, planting them more firmly and pushing them back past your hips so that you can feel how the poles help propel the body forward. This means that you can walk further and faster with not that much extra effort just the correct technique. Liz, our trainer was great she catered for both my needs as someone who is not very fit and my colleague Kelly’s needs as someone who is very fit and exercises regularly. Kelly: Nordic walking is surprising in a really good way, it is definitely more than a walk in the park. I was surprised at how fast I could move with little extra effort than normal walking. Knowing that for my 10,000 steps of exercise I was also doing 10,000 tricep exercises made me feel like it was really worth it. What is also great is that all levels of fitness can be accommodated in the group. When you are striding out you can really feel your upper body engaging. I also tried skipping, first on the flat and then uphill – this really got my heart rate up and ensured I was mixing the heart rate zones I was working in. Skipping uphill took me to 100% of my maximum heart rate; this is really useful if you want to build up speed rather than stamina. Laura: We both felt like we got a great workout from doing the walking. In total we did 6.5 km in about an hour and a half. After the walk I really felt like I had worked hard and exercised all the muscles in my body much more than I would have if I had just been out on a normal walk. Throughout the walk Liz showed us different things you can do with the poles like skipping and running with them. Kelly: So here are the numbers to compare ordinary walking with Nordic Walking. What you can see is that it is definitely worth changing to Nordic Walking to burn more calories and get more out of the time spent exercising. What’s interesting is that when Nordic walking you really do not feel like you are working harder. Laura: Once we had done a circuit of the forest it was time to do our cool down. We did some really deep stretches that felt amazing after doing a hard workout. I can honestly say I was shocked how different Nordic walking was to normal walking and you can feel the effects after just 1 session. I ached, in a good way, for 2 days after. It’s very sociable and great to do in a group. I will definitely be doing another session soon. Nordic walking is suitable for all fitness levels and is great fun I totally recommend it! Kelly: How great it felt to stretch out using the poles to get really deep long stretches. Nordic walking is sociable and very definitely worth it. I would encourage anyone to try it and hopefully more and more groups will spring up across the country. Track your diet, health & fitness with the Weight Loss Resources exercise diary and database. You can see how many calories you burn and how many you consume. Try It Free for 24 Hours. Liz Gibson has two “Learn to Nordic Walk” workshops scheduled to take place at Trent Park Country Park in North London on Saturday 17th March and Saturday 14th April. Workshops are aimed at absolute beginners and are from 09:30-11:30. 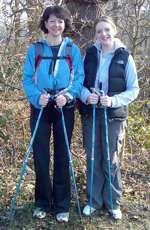 The cost per workshop is £15 and includes hire of Excel Nordic Walking poles. If you are interested in taking part in either of these workshops, please contact Liz on 07940 765865 or liz.gibson@gmail.com. Workshops must be booked and paid for in advance. If you would prefer a more personalised training session with Liz, one-to-one sessions or one-to-two sessions (with a friend) are available on weekends or evenings to suit at £30 per hour. For information about other INWA qualified Nordic Walking instructors in the UK or for a class near you, go to: www.nordicwalking.co.uk and look under “find a class”.